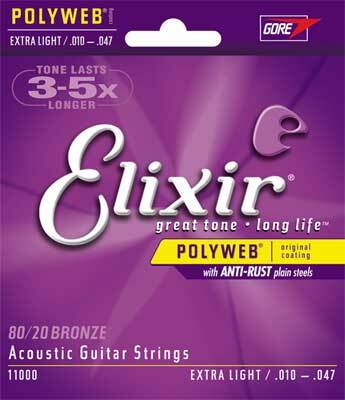 Elixir PolyWeb Acoustic Guitar Strings feel like a dream with tone that lasts! Elixir Strings boasting the original POLYWEB coating have the full-bodied sound you would get from broken-in strings. Touting an impressive life-span, these strings maintain their balanced tone 3-5 times longer than regular strings. Players agree, the smooth feel and substantial string squeak reduction will keep them coming back to Elixir PolyWeb Acoustic Strings time-and-time again. Elixir POLYWEB Acoustic String Features Incredible sound lasting 3 to 5 times longer than ordinary strings Balanced tone and smooth response Comfortably smooth feel with reduced finger squeak on chord changes ELIXIR Strings are covered with an ultra-thin, space-age polymer tube that contacts the string on the tops of the windings only. This leaves the all important winding-to-winding-to-core space free from the fear of the enemies of tone! No more gunk and goo. No more DNA evidence. No kidding. Play Elixir and Play in Comfort! Elixir Acoustic Phosphor Bronze Guitar Strings feature the exclusive, ultra-thin NANOWEB coating. Strings are not just strings. They are the connection between you and your music. When strings go dead, so goes the inspiration to play. After all, who wants to play when strings feel crusty and their sound is dull and muddy? It's a curse we lived with for years. 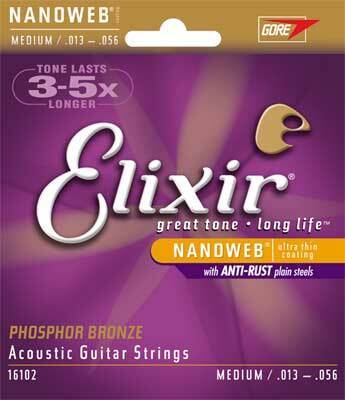 Elixir Phosphor Bronze Nanoweb Acoustic String Features Great Sound that lasts 3 to 5 times longer than ordinary strings Bright tone and punch like that of non-coated strings The Same Feel you get from Traditional String With a vision to change the world one set of strings at a time, Elixir set out to develop the cure for the common string. Strings that deliver great tone for a really long time. Strings that stay feeling clean and smooth. Strings that always inspire you to play. 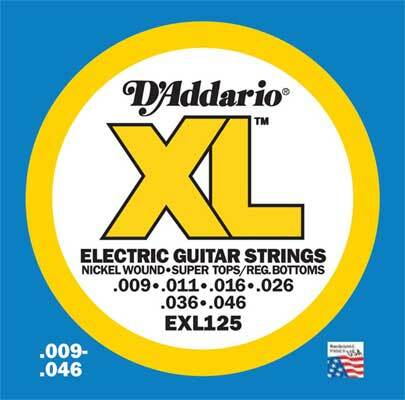 D'Addario XL Electric Guitar strings are world-renowned as The Player's Choice amongst gutiar players of all genres and styles. XL strings are wound with nickel-plated steel, known for it's distinctive bright tone and excellent intonation. Features Round wound Nickel-plated steel wrap wire Bright, true sound D'Addario String Alloy/Tone Glossary Electric and acoustic guitar strings, as well as all of their bass strings are produced by winding a wrap wire around a high-carbon steel hexcore wire. The type of alloy used as the wrap wire determines the tonal quality of the strings. Here's a quick reference guide: Nickel - D'Addarios XL strings are made using nickel-plated wrap wire. Nickel provides great overall tone and sound, and has been the best-selling type of electric guitar string over the last 50 years. Stainless Steel - D'Addario XLS guitar strings are made with a stainless steel wrap wire. Stainless steel provides a brighter, more cutting tone. They're generally used on electric instruments, but can be used on acoustic instruments as well. ProSteels bass strings utilize a specialized steel alloy that delivers super bright highs and deep, focused lows for a distinctive piano tone . Phosphor Bronze - D'Addario Phosphor Bronze acoustic guitar strings are legendary for their full, rich, acoustic tone. Phosphor bronze provides a warm and bright tone. They also produce Phosphor Bronze strings for acoustic bass. 80/20 Bronze - D'Addario 80/20 Bronze (also referred to as brass) acoustic guitar strings provide a brighter tone. 80/20 Bronze strings have great acoustic clarity coupled with extra-bright, loud tone.